Several years ago I was working with students at a local low-income middle school who were aiming to make something more of themselves. 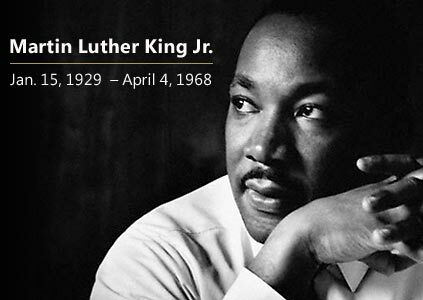 When asked who Martin Luther King, Jr. was they responded uncertainly with “he freed the slaves?” I wasn’t quite appalled, because it’s not surprising that most kids don’t understand the impact this man and those who have been inspired by him had on their everyday life. They know he did something important, but they just don’t understand how significant that impact is on them. He has been an inspiration to me since I was in 4th grade. We were required to find significant quotes from him and create a poster with those quotes. While I was indeed inspired by the “I Have a Dream” speech, that wasn’t the one that stood out for me. Instead, what I was drawn to were his speeches about love. I may have been the only one that year who used this quote. Later in college he was assigned reading for my philosophy courses. And his 1963 “Letter from a Birmingham Jail” is still one of the most influential pieces I have read. We owe it to ourselves and our communities to not just honor this man today, but to actively continue his work in each sector of life. To forge peace in our relationships with our loved ones. To recognize the interconnectedness of humanity in our dealings in everyday society. And to require of our leaders and policy-makers to reflect these values with each decision they make. Posted on January 16, 2012, in Current Events and tagged Bella Peligrosa, inspiration, society. Bookmark the permalink. Leave a comment.